Falcons QB Matt Ryan, Yankees SS Didi Gregorius, and Trail Blazers PG C.J. McCollum represent BR's Style Council." Banana Republic has released a new line of chinos called Rapid Movement ($98), made from a proprietary cotton-Lycra blend that offers the softness and breathability of cotton and the stretch (and bounce-back) of Lycra, so they’re comfortable and keep their shape over time. They come in four different fits for whatever look you’re into: skinny, slim, tapered, or vintage straight leg (for you traditionalists out there). They also have a nice selection of colors, from staid khaki to slightly bolder tones like blue shadow (a light blue grey) and burgundy. They’re also treated with a finish that helps repel stains and water. We personally dig the Fulton Skinny in blue shadow, but we’re sure you’ll find your own favorite. BR also got a bunch of pro athletes together, a group the company is calling their “Style Council,” to promote the new chinos as well as the brand’s other menswear. You’ll soon be seeing ads from the likes of Atlanta Falcons quarterback (and 2016 NFL MVP) Matt Ryan, New York Yankees shortstop Didi Gregorius, and Portland Trail Blazers shooting guard C.J. McCollum, along with Banana Republic’s brand ambassador Kevin Love, the four-time All-Star forward for the Cleveland Cavaliers. 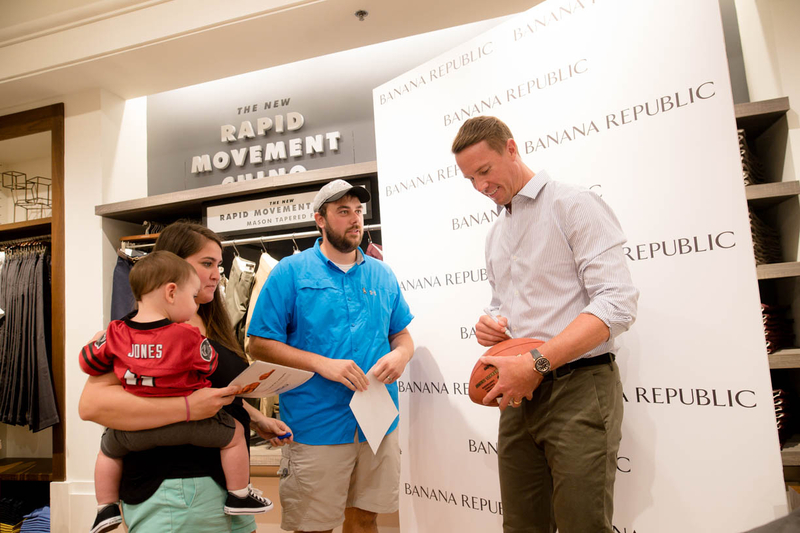 Ryan kicked off the Style Council with an in-store appearance at the Lenox Square Mall Banana Republic store in Atlanta, GA this week — one day before reporting to Falcons training camp. He’s shown below with a few fervent fans wearing the Grant Stripe Shirt ($64) paired with the new Aiden Slim Rapid Movement Chino ($98).